Bike races have been held in Sugarhouse Park since the 1950’s or earlier. The course is a classic circuit/criterium course that challenges cyclists with 2 hills high speeds, and usually a bit of wind. 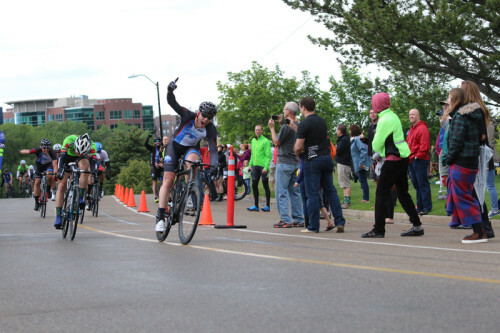 This year’s Sugarhouse Criterium presented by Team Tosh Cycling had a solid turnout despite the rain throughout May and that it coincided with Memorial Day weekend. Gabrielle Pilote Fortin, the Current Canadian U23 National Road Champion, (DNA) rounded out the podium for third. In the Pro/1/2 Men’s race, a field of 40 plus riders started with attacks from the gun. Here and there breaks of 4 or 5 would get away for a short spell, but everything was reeled back by the strong field. Later in the race, World Cup Nordic Combined skier and bike racer Taylor Fletcher (Cole Sport) took a turn animating the field as did 35-39 Masters Criterium Champion Darren Goff (Intermountain LiveWell). coming through the S-Turns. “We went up around the corner just full gas and I went full gas along the top. My head was spinning but they kept saying they were behind me.” Booth said “We were going across single file, just blazing speed. Dave Harward was leading out. There was a crash that happened right behind me. Someone spilled a water bottle. I heard guys hit the curb but I didn’t even look. It was just chaos. We came down the hill and somebody ran over a duck or something. It was just chaos into the sprint. The group just bunched up at the bottom of the hill and I just had a perfect line on the inside.” Booth took that perfect line and accelerated, passing the last rider at the top of the hill and held it to the line for the win. Young speedster Justin Griffin (FFKR/Contender) stayed on Booth’s wheel to finish second. LiVe Well p/b Bountiful Bicycle had their own leadout train on the right side of the final hill. Michael Hawley and Bryce Olsen finished 3rd and 4th respectively, with Trevor Jackson of SBR Cycles rounding out the podium in 5th. In the Men’s 3-4 field, Jace Heger (Rapid Cycling Racing, St. George) won the field sprint to take to the win. “You’re nubbing everyone’s elbows and handlebars trying to get yourself in position for the sprint.” He described his last lap, “There started to be a little leadout from the SBR team. I’m up here by myself. I don’t have any teammates and I just went with them and once we rounded the last corner it was a free for all.” Heger took the win, followed by Jon Larsen (Millcreek), and Evan Clouse. The Sugarhouse Criterium was also the Utah State Championship for Juniors and Masters. State Championships were awarded to Jase Hoover (Canyon Bicycles/Shimano) in the Junior Men’s 15-17 field, Ryder Jordin (Canyon Bicycles/Shimano) in the Junior Men’s 10-14, and Kira Crowell in the Junior Women’s 10-14 field. In the Masters, championships were awarded to Mike Underhill (Millcreek Bicycles) in the Men’s 35-44, Christoph Heinrich (Cicada Racing Inc. p/b Mark Miller Subaru) in the Men’s 45-54, Joseph Brubaker (Ski Utah/Plan 7) in the Men’s 55-59, Dirk Cowley (FFKR/Contender) in the Men’s 60-64, and Ken Louder (FFKR/Contender) in the Men’s 64-99. 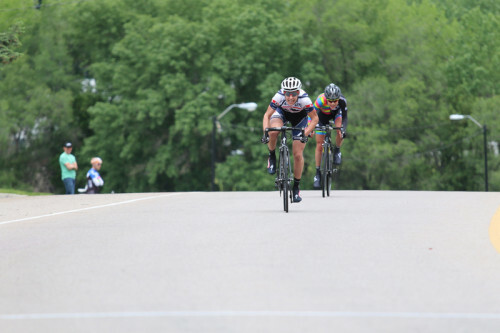 In the Masters women, titles were awarded to Alison Knutson (Harristone/Sun Valley Mortgage Cycling Team) in the 35-44 field and Mary Emerson (Team Tosh p/b Hyperthreads) in the 45-99 field.